Friday night around 2am I was having a conversation out in a dark alley, next to broken-out windows and dumpsters, with a fellow who told me that Nick Cave saved his life. Back in high school he listened to punk and often felt alienated from the other kids, from the metalhead contingent, the popular rock and the hair bands. Discovering music like Nick Cave's work with The Birthday Party, and then his early albums with the Bad Seeds in the mid-'80s, had opened up whole new worlds of literate music to him that intelligently and ferociously reached across all boundaries and grabbed hold of him. As we loitered in the darkness waiting for Nick Cave to emerge from the bowels of the Ogden Theatre after a mindblowingly amazing show, he told me how much Cave had resonated with him over the years. Standing there with his girlfriend, he held a copy of the 1985 album The Firstborn Is Dead to his chest, and in twenty minutes he would be walking away with Nick's writing across the front, lyrics to "A Train Long-Suffering" written in silver ink still wet around his picture on the black cover. As I touched his shoulder to say bye, he was shaking like a leaf. I am a latecomer to the cult of Cave, but after Friday night's sold-out and powerful show, count me as a convert. Apocalyptic and spiritual metaphors are the strongest that come up after you are baptized by fire into a Nick Cave show. 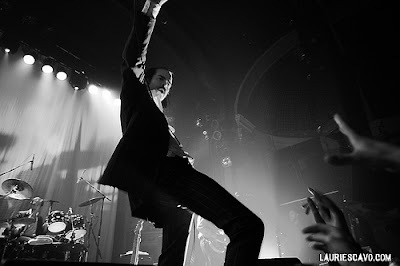 As he dances, stomps, writhes and howls onstage, slim and strong in his suit, sweating through his clothes, you feel like you are seeing some sort of punk-rock preacher come to save us from our sins (and planting ideas about a few new ones while he's at it). 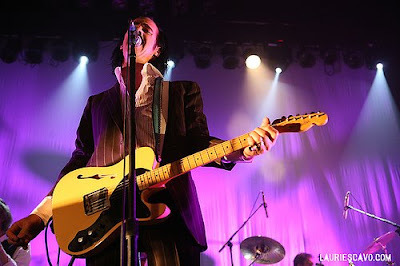 Cave is one of the most intelligent songwriters I know of, not afraid to mix the sacred and the profane to illustrate new meanings with a punch, or to take on old stories like the closing "Stagger Lee" and make it his own with lyrics I nearly blush to repeat. The music was potent, the performance pure undiluted rock 'n' roll. Cave performed everything from the title track from his latest album with aplomb (second in the set), to the earliest songs like "Tupelo" as well as beloved favorites like "Red Right Hand" and "The Mercy Seat." They held the stage for more than two visceral hours with no signs of letting up until the bitter end. 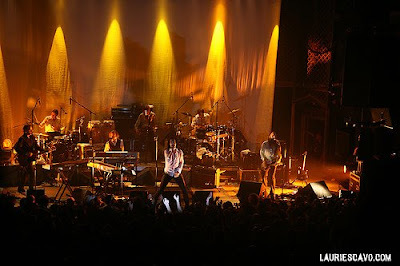 Friday night was one of the best shows I have seen in many moons, as I told Cave after the show. He replied that it had been his favorite of the tour as well despite some sound problems that plagued the beginning, leading to a hapless broken keyboard getting kicked off its stand by the towering Cave and his solid boots. Like everything else about the night, he was unrelenting. Nick Cave and the Bad Seeds play Chicago tomorrow night, then a quick lap into Canada, and back to NYC and DC before heading back to Europe. Anyway, heads up on a show you might have a blast at, if you haven't seen them, Oct. 18, the Kinetix with Vonnegut and Rob Drabkin ... Kinetix are really an underrated band that does an amazing show, full on energy ... it's at the Marquis, just thought I'd mention it. I've heard a lot of good things about Nick Cave but his CD's never really caught my ear. After reading this post, I definitely get a better impression as to why people like him. He's kind of like Morrissey I guess in his cult status. Would be down to see him live. Good post. Enjoyed it. Just in case you haven't seen it already. Very much recommended. If you like them, listen to the rest of the Anti- artists on their sampler. It's great.